This is s a simple modification of an original Black Shark skin I did years ago, adapted for the newer DCS engine. 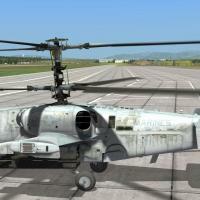 Installation: Simply cut and paste the folder into the DCS World\Bazar\Liveries\Ka-50 folder and go fly. And in the Mission Editor simply choose “HMLA-167” in the Paint Schemes drop down menu.